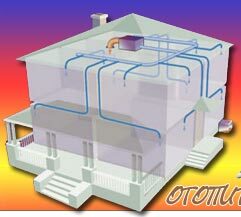 One of basic elements of systems of water heating - the heating device - is intended for a heat transfer from the heat-carrier in a warmed premise. For maintenance of necessary temperature of a premise it is required that during each moment of time teplopoteri premises QРї became covered teplootdachej heating device Qpr and pipes QС‚p. The Scheme teplootdachi heating device Qpr and pipes QС‚СЂ for compensation teplopoter premises QРї and QРґРѕРї at heat transfer QС‚ from outside the water heat-carrier is resulted on fig. 24. Warmth QС‚ brought by the heat-carrier for heating of the given premise, should be more teplopoter QРї on size additional teplopoter QРґРѕРї, building designs of a building caused by strengthened warming up. the Heating device is characterised by the area of heating surface FРїСЂ, m 2 , counted for maintenance demanded teplootdachi the device. Heating devices on a prevailing way teplootdachi are subdivided on radiating (ceiling radiators), konvektivnoradiatsionnye (devices with a smooth external surface) and konvektivnye (konvektory with a ridge surface). At heating of premises by ceiling radiators (fig. 25) heating is carried out mainly at the expense of radiant heat exchange between heating radiators (heating panels) and a surface of building designs of a premise. Radiation from nagretoj panels , getting on a surface of protections and subjects, it is partially absorbed, it is partially reflected. Thus there is the so-called secondary radiation also eventually absorbed by subjects and protections of a premise. Thanks to radiant heat exchange the temperature of an internal surface of protections in comparison with temperature raises at konvektivnom heating, and the temperature of a surface of internal protections in most cases exceeds temperature of air of a premise. At panelno-radiant heating thanks to rise in temperature of surfaces conditions favorable for the person are indoors created. It is known that the state of health of the person considerably improves at share increase konvektivnogo teploperenosa in general teplootdache its bodies and reduction of radiation by cold surfaces (radiating cooling). It just also is provided at radiant heating when teplootdacha the person by radiation decreases owing to rise in temperature of a surface of protections. At panelno-radiant heating fall against usual (standard for konvektivnogo heating) air temperatures in a premise (on the average on 1-3 В° in this connection even more increases konvektivnaja teplootdacha the person is possible. It also promotes improvement of state of health of the person. 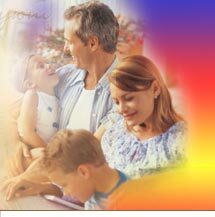 It is established that in usual conditions the good state of health of people is provided at temperature of air in 17,4 В° With at stenovyh heating panels and at 19,3 В° With at konvektivnom heating. 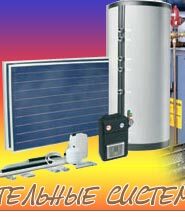 From here reduction of the expense of thermal energy on heating of premises is possible. considerable thermal inertia of these panels. Devices with a smooth external surface are radiators section, radiators panel, gladkotrubnye devices. Devices with a ridge heating surface - konvektory, ridge pipes (fig. 26). On a material from which heating devices are produced, distinguish the metal, combined and nonmetallic devices. Metal carry out basically from grey pig-iron and a steel (a sheet steel and steel pipes). Apply also copper pipes, sheet both cast aluminium and other metals. In the combined devices use teploprovodnyj a material (concrete, ceramics, etc.) in which close up steel or pig-iron heating elements (panel radiators) or orebrennye the metal pipes placed in nonmetallic (for example, asbestotsementnyj) a casing (konvektory). concrete panel radiators concern nonmetallic devices with the closed up plastic or glass pipes, or with emptiness, and also ceramic, plastic and other radiators. On height all heating devices are subdivided on high (height more than 650 mm), averages (more than 400 to 650 mm), low (more than 200 to 400 mm) and plintusnye (to 200 mm). On size of thermal inertia it is possible to allocate devices of small and big inertia. Quick-response devices have small weight and contain a water small amount. Such devices executed on the basis of metal pipes of small section (for example, konvektory), quickly change teplootdachu in a premise at regulation of quantity of the heat-carrier let in the device. The devices having the big thermal inertia - massive waters containing a significant amount (for example, concrete or section radiators), teplootdachu change slowly. For heating devices besides economic, architecturally-building, sanitary-and-hygienic and industrial-assembly requirements are added still heats-technical requirements . From the device transfer from the heat-carrier through area unit in a premise of the greatest thermal stream is required. For performance of this requirement the device should possess the raised value of factor teplootdachi kpr in comparison with value of one of types of section radiators which is accepted for the standard (a radiator pig-iron type Рќ-136).